Winter wedding cakes explored through pictures often provide closeup details. You can browse wedding cake photos to discover which winter designs you like best. For an elegant, sophisticated affair, square wedding cakes with crystal or edible snowflakes are a popular and beautiful design. 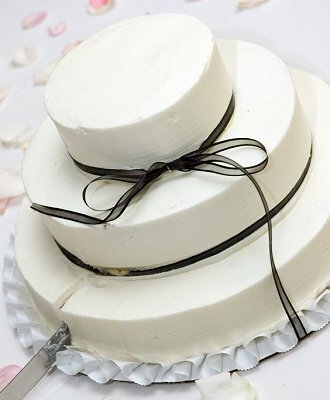 The cake could be all white or could have satin accent ribbons that coordinate with the wedding colors if desired. Add a bit of winter whimsy to your cake by creating a fluffy "snow" cake topped with bride and groom skiers. Snowmen, reindeer, Santa and Mrs. Claus, and penguins are other fun choices for a winter-themed cake. Silver details are popular for winter wedding cakes. Filigree patterns, silver dragees, metallic monograms, and other silver details add a cool glitter to your cake and will coordinate with any wedding colors. Ribbon wedding cake toppers are a fun choice for winter weddings that are reminiscent of wrapped packages during the holidays. The ribbons can be real or edible, and they can be in any color or pattern you desire. For even more elegance, cascade the tails of the ribbon down the sides of the cake to add texture and dimension to the design. Wedding cupcakes are a fun and affordable option for winter celebrations, and they are easy to decorate with winter themes. Snowflakes, holiday colors, icicles, winter birds, or just white "snowball" cupcakes are all great choices. A black and white wedding cake is suitable for any season, and you can add winter details to the design by choosing a crystal wedding cake topper. Strands of crystals that resemble ice or fresh snow add an elegant chill to the design while also adding sparkle and flair. All white cakes are popular winter designs. Whether you want abstract dots, filigree patterns, and swirls or classic roses and icing flowers on your cake, all white icing is reminiscent of the season's snow. Any cake design can have winter flair when displayed on a themed cake table. A sleigh-style wedding cake stand pulled by white reindeer is perfect for a winter cake, or add a Santa figure for a quirky holiday touch. Other cake table decorating ideas include nativity scenes, pine boughs, fake snow, crystal pine trees, small wrapped packages, or other seasonal accents. Blue in any shade, from ice blue to midnight blue, is popular for winter weddings. Accentuate the chilly color with a clear crystal or glass figurine wedding cake topper for a wintery touch. Many couples opt not to have traditional wedding cakes at all. For a winter wedding, alternative treats such as gingerbread, holiday cookies, and trifle are just as tasty. A gingerbread house can even be designed to resemble the church where the couple is married, their home, or their honeymoon destination. Small petit fours and individual cakes are elegant options for a wedding cake. Add seasonal touches such as a snowflake sugar cookie, faux pine boughs, or holiday ribbon to coordinate these personal cakes in a meaningful and beautiful way. Rich jewel tone colors are always popular options for winter weddings, and they can easily be used to decorate the wedding cake with flowers, ribbons, or colored icing. Ruby, emerald, burgundy, wine, and gold are popular winter colors that beautifully accent a white cake. Peppermint is a seasonal favorite all winter long, so why not choose a peppermint wedding cake? A chocolate mint cake is especially decadent when decorated with candy cakes and peppermint accents. White chocolate wedding truffles can be added to a wedding cake to simulate snowballs or just to add a bit of richness and elegance to a cake design. Single tier wedding cakes are perfect for intimate celebrations, and holiday cake designs that include holly, mistletoe, Christmas trees, and other seasonal symbols are fun and colorful decorations.